A so-called 'superloo' exploded in a town centre when an electrical fault caused water to surge back into the toilet, blowing off its roof and lifting the pavement. Luckily no one was using the Automated Public Convenience at the time but it was badly damaged and remained closed on Wednesday while engineers worked at the site. Energy bosses blamed a fault in high voltage cables underneath the toilet, in Hanley town centre, Stoke-on-Trent, and said an investigation was under way. Police were called to reports of an explosion in Hanley town centre, Stoke-on-Trent, at 0445 GMT on Wednesday. Officers found the roof ripped off and smoke coming from inside. Parts of the surrounding pavement had also been lifted. A spokesman said there were also unconfirmed reports that nearby traffic lights had been affected. Rebecca Jackson, from Aquila, said they had isolated the cable but were investigating the fault and the siting of the toilet. "This could have been quite distressing if not dangerous if someone had been in there and we are taking it very seriously," she said. "We would like to reassure domestic customers this isn't something that is likely to happen in their own homes. "They have low voltage cables and lines going into their properties, their homes should not be sited over high voltage cables." The toilet, an Automated Public Convenience, was operated for the city council by JC Decaux. 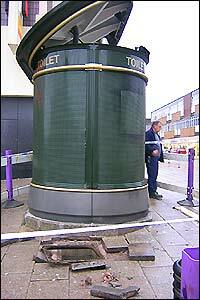 The council's spokesman, Terry James said: "The toilets have been there for around two or three years. "It doesn't appear to be vandalism or terrorism, it does appear to have been a technical problem."